1. Blood flows away from the heart. Blood flows towards the heart. 2. Blood flows with jerks and with great pressure. Blood flows smoothly and with less pressure. 3. They always carry oxygenated blood except the pulmonary artery. They always carry deoxygenated blood except the pulmonary vein. 4. Lumen of arteries is small. 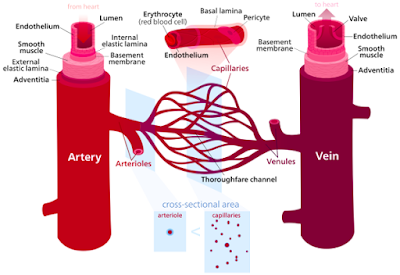 Lumen of vein is large. 5. Valves are absent. Semilunar valves are present to prevent the back flow of blood. 6. They are deep seated. They are usually superficial. 7. Their walls are elastic, thick and muscular. Their walls are non-elastic, thin and fibrous.